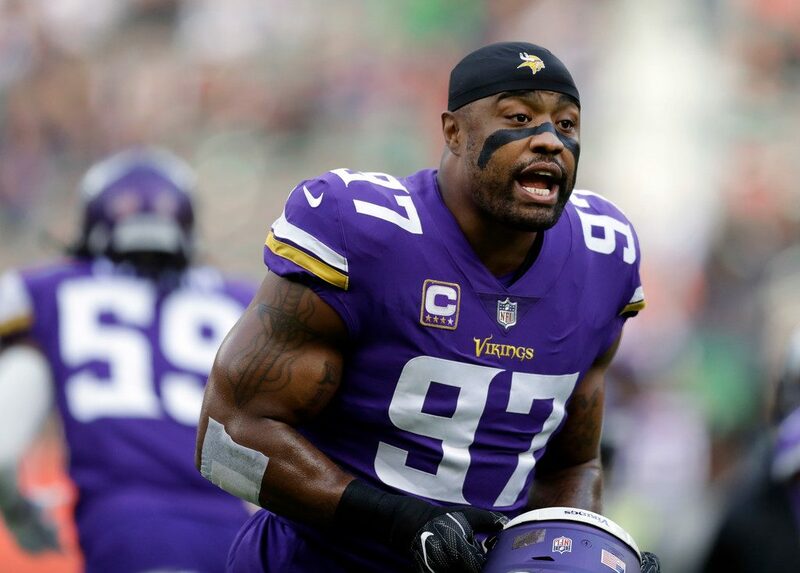 The Vikings were hailed for their proactiveness when they signed Everson Griffen to a new deal before the 2017 season, locking up the defensive end through the 2022 season even though he had two years left on his existing deal. While the contract did extend the marriage between the Vikings and Griffen on paper, its structure did something else: It guaranteed the Vikings the kind of leverage they could exert over Griffen in the coming weeks, Ben Goessling of the Minneapolis Star-Tribune reports. Griffen’s old deal had him set to make $7 million in 2017 and $8.5 million in 2018, with none of the money in those two seasons guaranteed. His renegotiated deal put an additional $2 million in his pocket for the 2017 season and an extra $1.5 million for 2018, with Griffen getting $6.2 million in cash at the time of the deal’s completion. The deal effectively solidified Griffen’s status for two seasons he was under contract with the Vikings anyway, fully guaranteeing his 2017 base salary and delivering another $5.5 million roster bonus last May. Beyond that, though, it essentially gave the Vikings control of Griffen’s future, and the structure of the contract means a decision on Griffen could be coming in the next month. Like his 2018 base salary, Griffen’s 2019 base was guaranteed against injury at the time he signed his new deal, and will become fully guaranteed if he’s still on the roster by March 15 (the third day of the 2019 league year). His base for the 2019 season, however, is $10.9 million. The Vikings would face just $1.2 million of dead money charges if they released Griffen, while recouping $10.7 million of cap space. The contract’s structure is similar to many of the deals the Vikings do, and it’s not unusual in the NFL, where the cold reality is that a player’s relationship to his team is often only as strong as his recent performance or the guaranteed money in his contract. Griffen’s battles with mental health issues during the 2018 season could cast a business decision in a cruel light, but a Vikings team not flush with cap space is nonetheless likely weighing its options in the final weeks before free agency. Griffen, who turned 31 in December, posted 5 1/2 sacks for the 2018 season and notched 4 1/2 in the eight games he played after returning from his five-game absence, while playing around 80 percent of the Vikings’ defensive snaps in that time. Those are solid numbers, to be sure, but when Griffen’s current deal makes him the ninth highest-paid defensive end in the league, the Vikings might not view his production as being worth his scheduled price tag for 2019. That could be especially true given the year Danielle Hunter had, and what he did on the right side while Griffen was out.